Residents of Manhattan are sure to have been to or heard about Hu Kitchen. The Paleo restaurant is never not buzzing thanks to the thoughtful philosophy and delicious food. The cuisine is so fabulous you would find it hard to believe that every bite is nutritionally sound and ethically sourced. All this is by design. Genius siblings Jessica Karp and Jordan Brown set out to help people Get back to Human after they had their own personal health and food revolutions. Now as the leaders of this cult company (seriously the chocolate has a crazy following) the duo continue to build on their success. How did you get the inspiration to start Hu Kitchen? JESSICA KARP/ JORDAN BROWN: Jordan was coming home from a real estate conference in Las Vegas of all places and picked up a copy of Dr. Mark Hyman’s book, The UltraMind Solution. He was so inspired by what he was reading – new concepts to him such as systemic inflammation, blood sugar and insulin, gluten intolerance, etc. to name a few – that he started experimenting with different ways of eating. Around the same time, my husband, Jason, was dealing with some autoimmune issues and was using clean eating as a way to heal himself. The two of them would geek out over what they were eating and how amazing they felt. Initially I rolled my eyes at them and continued my normal calorie counting ways; ignoring what the actual ingredients were in my food. Then I had my daughter, and everything changed. I had to know every single ingredient that I was feeding her. So all of a sudden I had to ask myself, what am I putting in MY body?? And finally it clicked for me. As all three of us embraced cleaner eating (and Jordan REALLY embraced Paleo), we realized how difficult it was to eat out. The level of integrity we were looking for in a dining experience was missing from the New York landscape. We wanted to create a place where people could trust the ingredients implicitly while also eating delicious, culinary-inspired food. Why are natural ingredients and honesty so crucial to your ethos? JK/JB: We basically created Hu because we needed somewhere we could eat ourselves. We wanted to know what was in our food, and our customers do, too. Ingredients are everything. The name “Hu” comes from our slogan “Get Back to Human,” which is the foundation of our brand. Eating real food and simple ingredients is what makes us human and lets our bodies thrive the way they were intended to. People come to Hu because they know we vet everything that we put into our recipes. They trust that. There is integrity in what we serve. But taste is also a huge part. When you cook with clean ingredients you don’t need to sacrifice on flavor. Real food is delicious. What do you think are some of the biggest misconceptions about Paleo food? JK/JB: People think Paleo means you eat massive quantities of only meat - which is not true at all (you CAN do that, but that’s not what we do). There are various interpretations of the Paleo Diet, and some are stricter than others. But on a simple level you eliminate all processed foods in addition to cutting all grains (both gluten and non-gluten grains), dairy, refined sugars, and soy/legumes. Eating paleo means you can eat a really well-rounded diet of 100% grass-fed meats, quality poultry, wild fish, lots of vegetables, fruits, nuts and seeds. There are a ton of options. And they don’t need to be boring. Hu Kitchen’s food is predominantly paleo and all gluten-free, with unique items such as grain-free almond-crusted baked chicken tenders, grain-free wild fish sticks, grain-free almond/coconut-flour pancakes, grain-free blondies/brownies/cookies, non-dairy coconut yogurt, dark chocolate . . . that’s just a sampling. We are all about indulging and preparing paleo-compliant versions of those types of foods we grew up loving. All of those items typically have grains and gluten, and some normally have refined sugars – Hu’s do not. We create paleo versions of these comfort foods that are familiar but prepared in a different way with cleaner ingredients. And they are delicious and satisfying. The restaurant business is crazy- how did You approach opening a restaurant in the most insane city in the world? JK/JB: It IS crazy! New York City is hands-down the most difficult place to run a restaurant. Neither of us has a background in the restaurant industry. So when we started to think about opening Hu Kitchen, we hired a restaurant consultant to guide us. We spent around 6 months doing market research and honing a concept that was viable before we started looking for a space and fine-tuning our ingredient and recipe offering. Then when we started the hiring process, we hired people with lots of restaurant experience who knew the ins and outs of how the business works in New York City. But it was definitely a huge learning process for us, and we had fantastic help along the way. 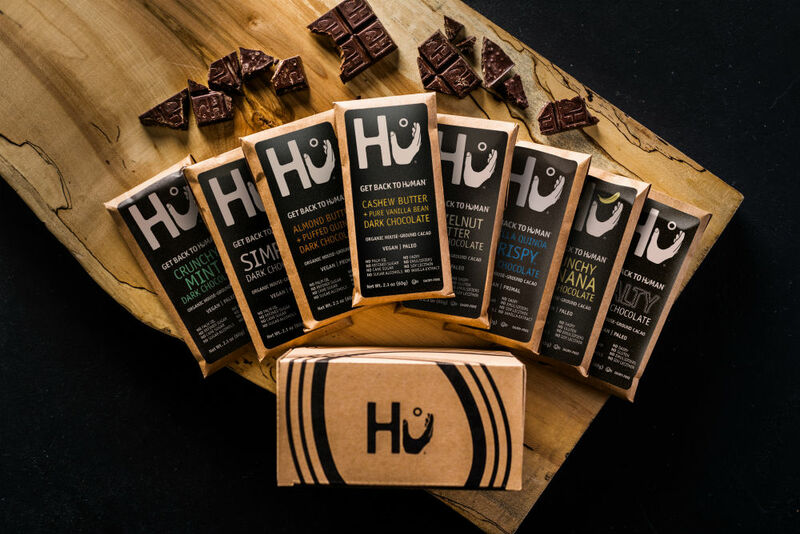 Hu chocolate is such a cult favorite- what was the inspiration behind it? JK/JB: When we were first developing the menu for Hu Kitchen, we wanted to have an extensive line of baked goods. But we couldn’t find any chocolate that met our ingredient requirements that also tasted delicious. Most chocolate has dairy, soy and refined/cane sugar, and we don’t allow any of those items in our baked goods or the other food at Hu. So we decided to create our own chocolate to bake with. When we had the final version of the baking chocolate, we realized we were onto something big because it tasted so amazing! So we developed a line of chocolate bars that we started selling in the restaurant. They immediately developed a cult following, and shortly thereafter we started selling the chocolate to other retailers. Whole Foods Columbus Circle was actually our first account! JK/JB: Measured expansion is what we are working on now – both on the products (CPG) side of the business and on the restaurant side of the business. We recently completed a capital raise for the CPG business – it is a fantastic group of new investors led by highly strategic people ranging from very successful food entrepreneurs to notable personalities and doctors like Tim Ferriss and Dr. Mark Hyman. We are developing new chocolate bar flavors and several other new chocolate products that are not bars. In addition, we are expanding our line of coffee (Coffee For Humans). We are increasing our production capabilities on all fronts and adding team members. On the restaurant side, we are continuing to innovate on our menu and are improving our flagship location in Union Square in the coming months. We will look to expand into other locations in late 2019 with an exciting smaller square-footage concept.